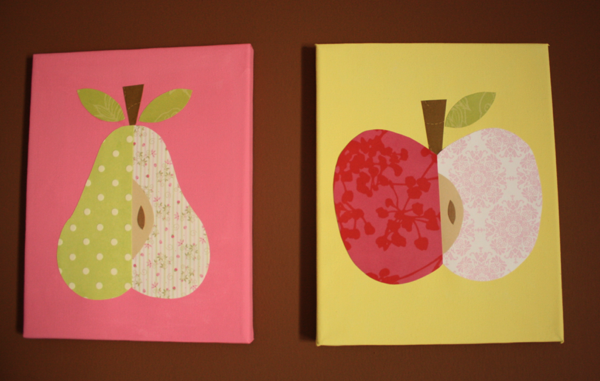 To make Chloe’s nursery canvases, I used a mixture of paint, paper, and fabric to create completely unique art for her wall. 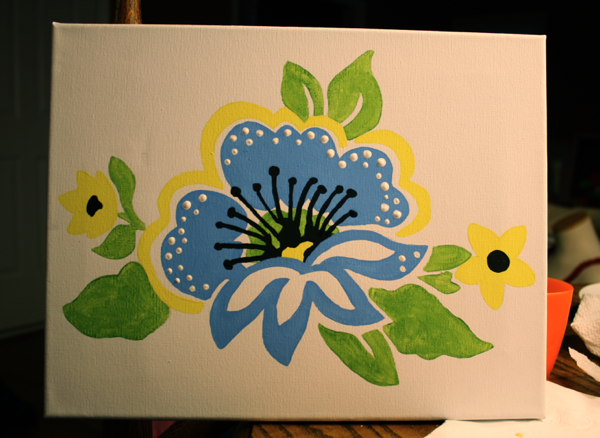 I started with the fully painted canvases. 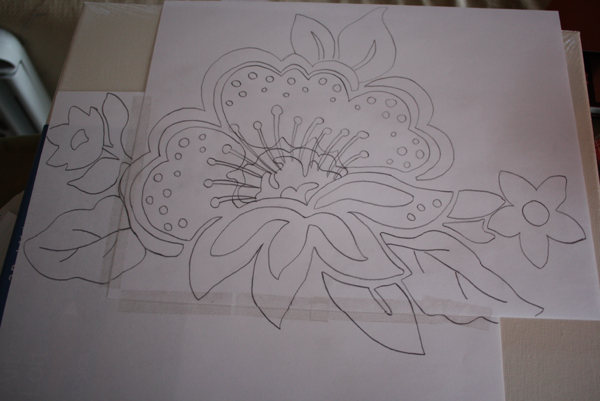 I found an image from one of the fabric prints that I liked, then I blew it up on my computer to the size of my canvas, and traced it on computer paper. Then, channeling my elementary school art days, I flipped it over and filled in the back using a regular lead pencil tilted at an angle. Then I flipped it back over, taped it to my canvas in a few places, and made little reference points on the canvas to make sure I returned it to the exact same spot each time. 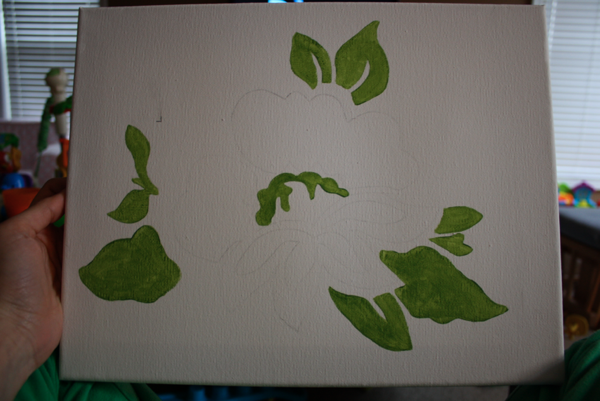 I started with the green pieces, so I traced them first. 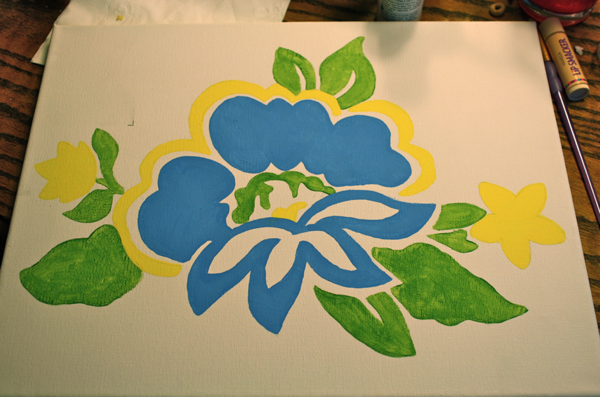 Once it was dry, I moved on to the next color, in the order that made the most sense. 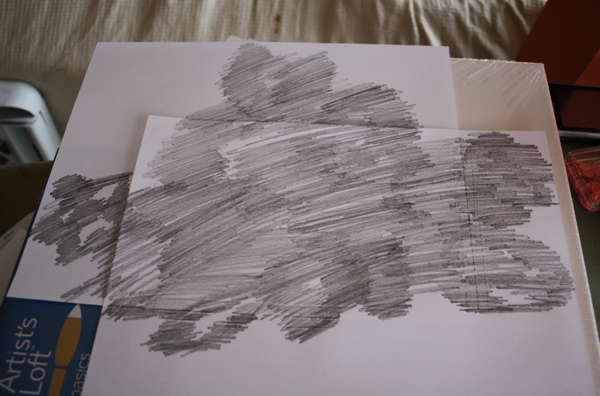 Then I washed off the reference points and it was finished!! 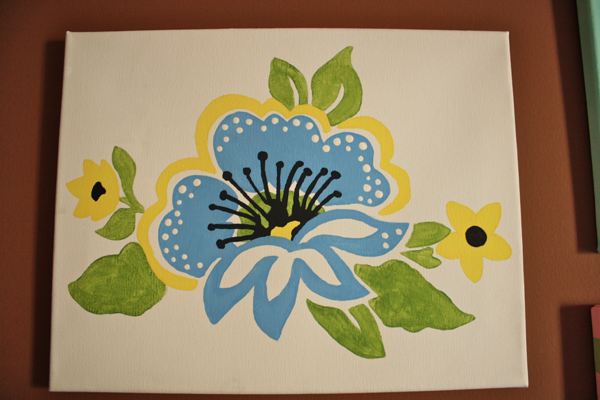 I followed the same steps for this canvas, also from one of the fabric prints, except it was much simpler to do. 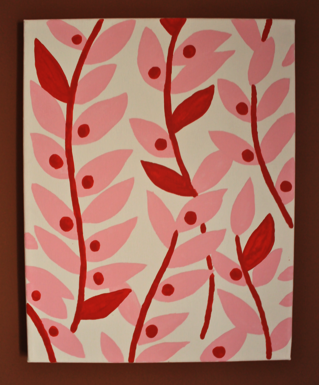 I painted all the pink, then went back and added the red on top. 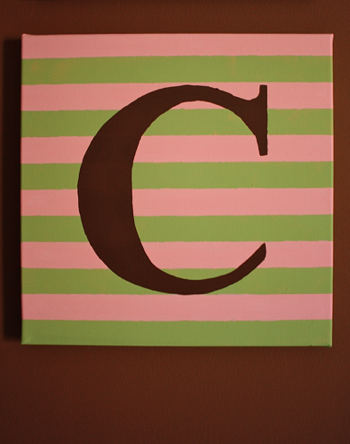 And for the “C” I simply painted the whole canvas pink, went back and taped off 1″ spaces with 1″ painters tape and added the green stripes. 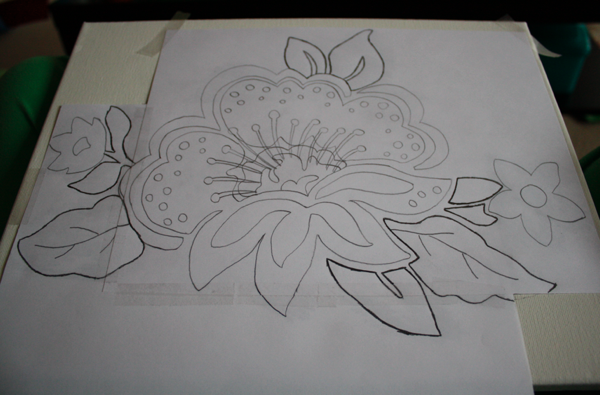 Once it was dry I used the same tracing method to draw the C on top of the lines, and filled it in with brown paint. 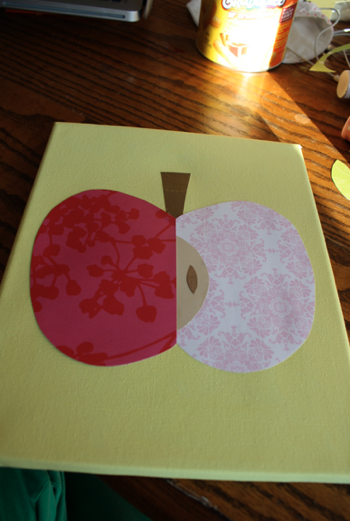 The apple and pear are painted backgrounds, with paper pieces glued on top. 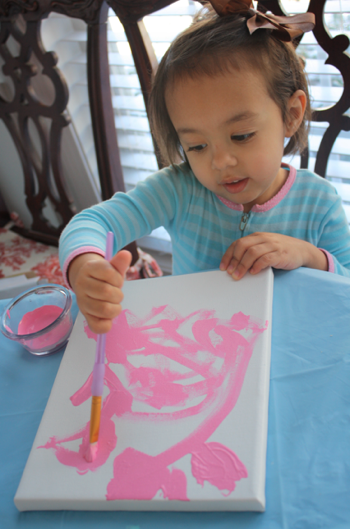 I enlisted some help with the painting for these while I cut the paper. 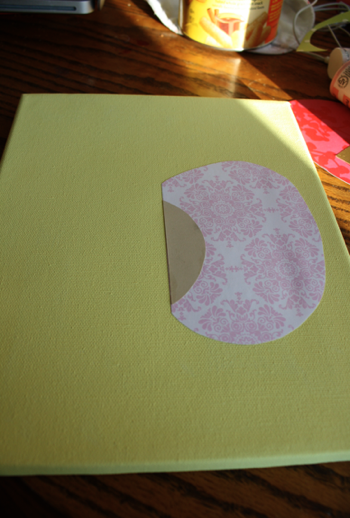 Then starting with the bottom shapes, I glued (using Mod Podge because I couldn’t find my Aleene’s) the pieces on. Then to let them dry without rippling, I turned them over and placed a heavy book on the back of the canvas so it would be perfectly flat. 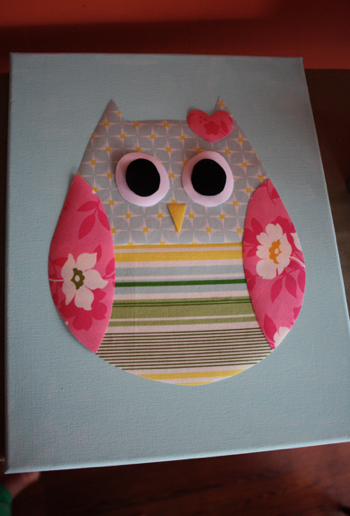 Then for the owl, I used only fabric (other than the painted background). 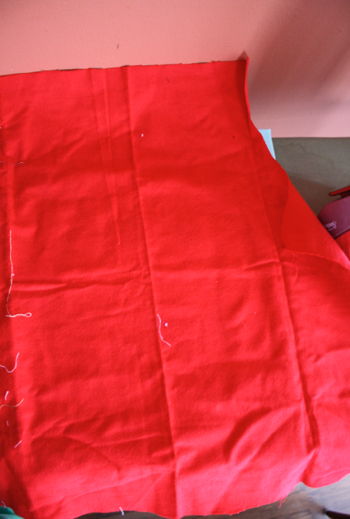 I traced the shapes on regular (red) Heat n Bond and ironed them on at the same time. 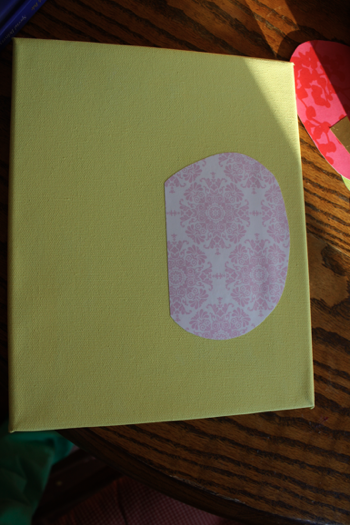 I covered the whole canvas with a scrap piece of fabric and ironed lightly, until all the pieces stuck. 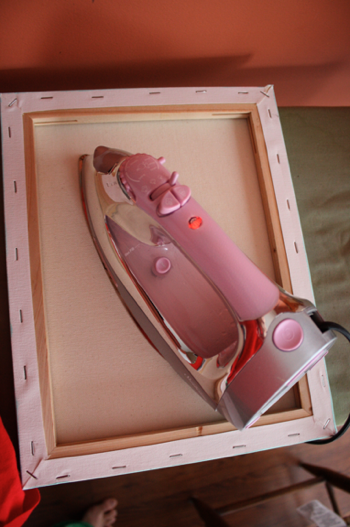 Then turn the whole thing over and iron from the back side to get a good seal on the Heat n Bond. 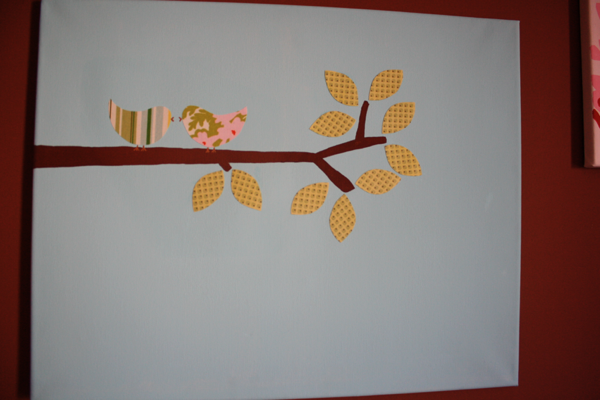 And lastly, the birds. I used a mix of all the previous techniques to make my birds. First I freehanded the branch with brown paint. 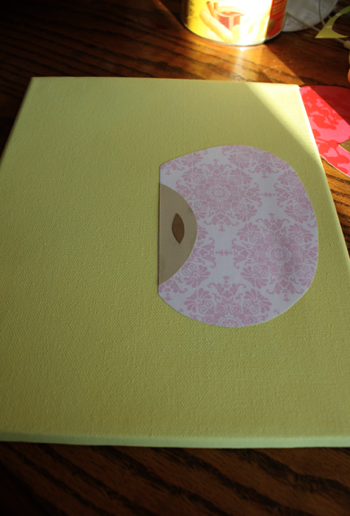 While it dried, I cut the leaf shapes from scrapbook paper and glued them on. 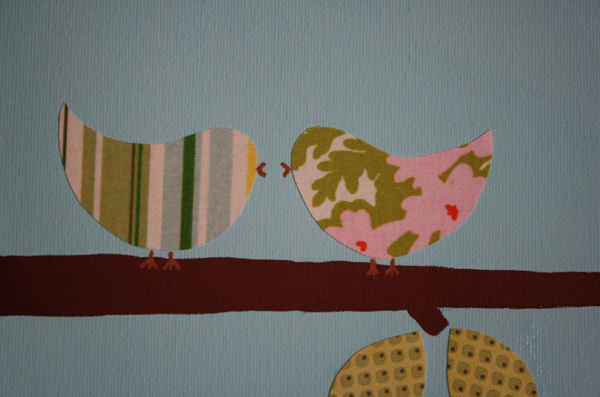 I cut the birds from scrap fabric on Heat n Bond and ironed them on, then painted their beaks and feet. And that’s it!! I already had all the fabric, paper, and some of the paint, so I just bought the canvases (50% off at Michael’s) and a few bottles of paint! 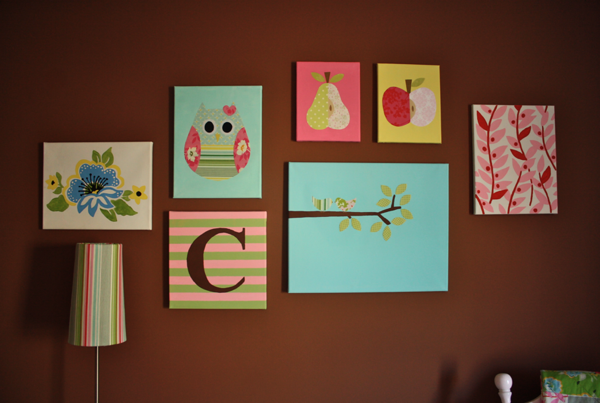 It cost me less than $20 and a few afternoons of crafting to create this adorable wall art! Oh my gosh …. too adorable. Our first GreatGC is due anytime … can’t wait to show GD your ideas. Thanks. Brilliant combination of techniques! Thank you for sharing so much creative thinking. Thank you so much for being so detailed and posting this. I have been wanting to my sons name on canvas instead of the wood letters. 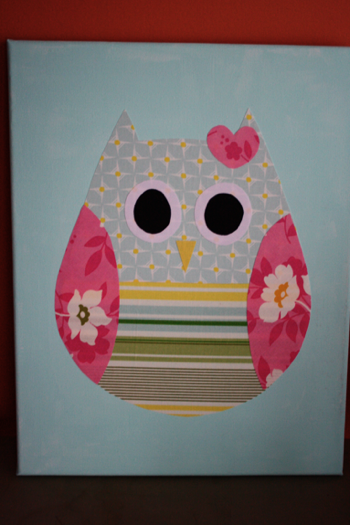 I too bought the canvas from Michaels (50% off) but was completely lost on how to go about doing them – thank you again. 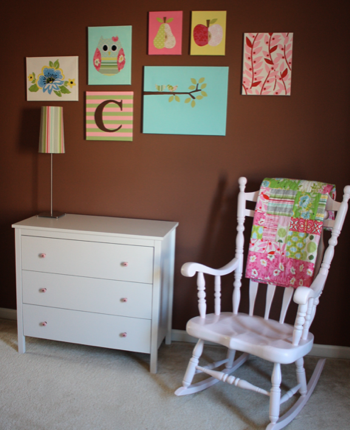 Now I am ready to work on his nursery and it will be perfect for our family. Okay, first off let me say, this is adorable, it’s just I don’t know how to get all that fabric in the same designs and colors. 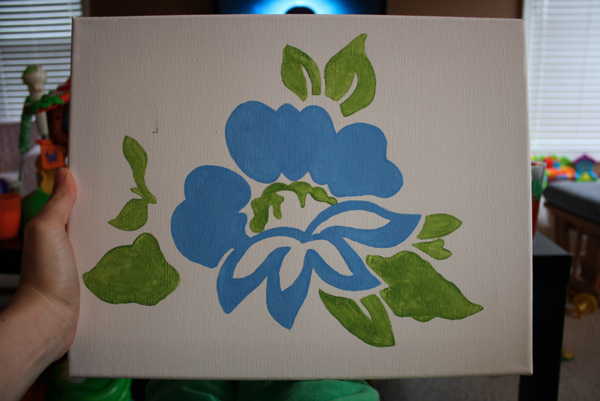 Do you think it would look bad is I just painted it all? No, if you’ve got the artistic skills, I say go for it! It would be precious totally painted! I LOVE LOVE this is is so cute!!!!!!!!!!!!!!!!!!!!!!!!!!!!!!!!!!!!!!!!!!!!!!!!!!!!!!!!!!!!!!!!!!!!!!!!!!!!!!!!!!!!!!!!!!!!!!!!!!!!!!!!!!!!!!!!!!!!!!!!!!!!!!!!!!!!!!!!!!!!!!!!!!!!!!!!!!!!!!!!!!!!!! !